i wandered over to brick lane last week. apparently, it is known to locals as "bangla town" and is famous for its curry restaurants. as much as i love curry, however, i go to brick lane for the bagels. have you ever seen the seinfeld episode with the soup nazi? they find a hole-in-the-wall soup shop with amazing soup, but the man who runs it is prone to say, "no soup for you!" and refuse to serve them. the brick lane bagel shop is a bit like that. the menu is virtually indecipherable (partly because they alternately spell it, "beigel" and "beighel") and the service is quick and efficient. which is to say that if you don't know exactly what you want, and if you don't order it without wasting words, they move onto the person behind you. "hi, what's the special of the day?" "ummm... i think i'll have..."
"what kind of bagels do you have?" yes, you read that right. SIX BAGELS FOR 90 PENCE. that is only one of the reasons i love this place. it is also open 24 hours (!) and the bagels are oh...sooo...goooooood. so i'm savoring each and every one of them, but the good news is that when i run out, i can go back any hour of the day or night and get my fix. 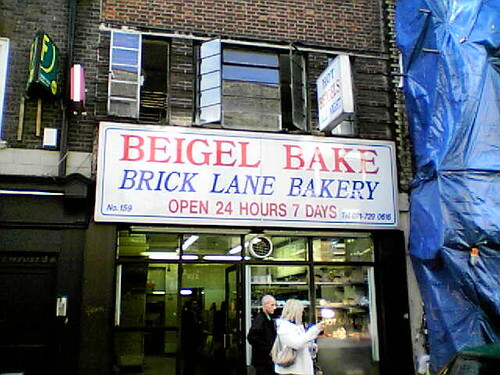 oh, that's my favourite Beigel shop! I like to get a dozen and freeze half. Perfect for breakfast, toasted with Green & Black's Hazelnut spread and peanut butter. Mmmmm.